Sequencing fun fall stories like 'There Was an Old Lady Who Swallowed Some Leaves'or 'Run Turkey Run' (links at the end of this post). Creating a Class Book about being a Scarecrow. "Scarecrow, Scarecrow, scary as can be! You scared a ____________, but you can't scare me!". Fill in something the scarecrow scared and draw a picture of it. Go on a Fall Scavenger Hunt. Write names of fall items to find and draw a picture next to them. Can you find all the items on your list when you go hunting outside? Labeling a scarecrow: bring a scarecrow into class. Work as a group to listen for the beginning sounds of the parts of the scarecrow. For example, his hat starts with the 'h' sound. Write an 'H' on a sticky note and stick it to his hat. Paint with leaves that you found on a leaf hunt (after reading the book 'We're Going on a Leaf Hunt'). Create a leaf man out of real leaves and use markers and googly eyes to embellish after reading the story 'Leaf Man'. Paint with pumpkin pie spice scented paint. Just mix a little pumpkin pie spice and cinnamon into some orange paint. Create clay turkeys using brown clay, googly eyes, fake feathers and orange pipe cleaners for the feet and beak. Do some leaf rubbings - traditional, yet fun! Sort leaves (real or fake) by shape and/or color. Using a balance scale weigh pumpkins and compare the weights (could use gourds and acorns too). Do some oral sound patterns. Gobble quiet, gobble loud, gobble quiet, gobble loud - creating a sound pattern. Play a Turkey Race game using a die, number line to 20 and two clothespins decorated as turkeys. In this two player game- each child gets a turkey. He or she rolls the dice and moves his/her turkey that many numerals on the board (starting at 1). When it is the players turn again, he or she rolls the die and move that many spaces from where he last landed. Who can make it to 20 first? Create a fun sensory bin ready for little working hands by combining dry beans of different types and fake feathers. Add scoops, ice cube trays, funnels and measuring cups and watch the magic unfold! I love letters. You know, the alphabet kind.... well, truth be told I like the 'open up the mailbox' kind too. I'm not sure if it is because I am a preschool teacher or if it is because I have always excelled in reading/writing (as opposed to math... numbers + me = yikes). But, letters are my jam. Don't get me wrong, I want my kiddos to learn letters and letter sounds as well. But, I do not believe that pushing my preschoolers with flashcards and drill and practice is the way to go. I mean, they do learn best through play- God made them that way! So, why don't we have fun and play while learning letters? So, in today's newsletter I thought I'd share some of the ideas I use to bring letter learning into circle time. These are the ways that I purposefully plan letter experiences for my preschoolers (which happens to be in circle time for us). But, please know that we do connect with letters and sounds all day long through books, centers, conversations and other activities. Included in the link below you will find 8 alphabet ideas for circle time. You will also find my letter cards (NOT flashcards...please, please do not use these as flashcards). Letter cards are what I use to help children visualize the letters and I use them in all the activities in circle time. Now, you may be asking yourself- so does she do all 26 letters in each of these activities? (okay, so you probably were not asking yourself this, but hey- go with me) The answer is...heck no- that might take all day! Long activity = bored checked-out children. I use the letters that my students are having the most trouble with. I get this info from the assessments I do 3 times a year. It works great for me! What is a class book? A class book is a homemade book that includes a page from each student in the class. We love to make class books in our pre-k class. Not only are they perfect for the literacy center, they are also a great keepsake. We are going to create enough class books this year so that every child can have one at preschool graduation! 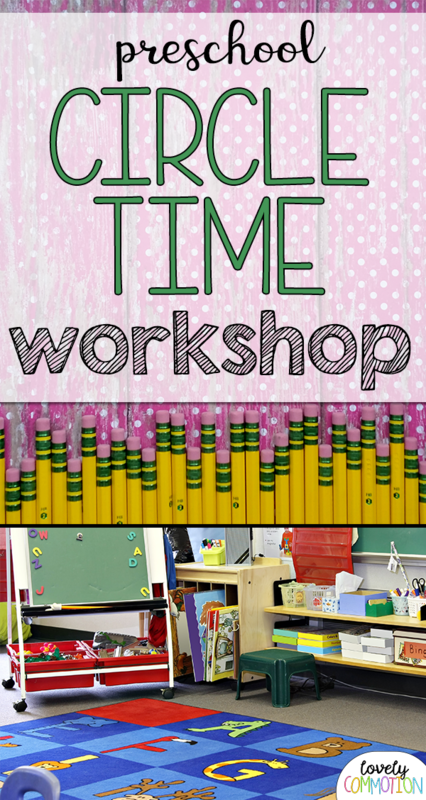 Why you should be making class books in your preschool classroom. Each child gets to be included in the book, therefore they take ownership and pride in the book. When placed in the literacy center, class books are a popular choice for reading over and over again, making them great repetitive books for students to 'read'. When children take part in the book making process, they have a better respect for how to treat their books. Class books can be adapted to focus on skills that children need support in. What kind of Class Books do you make? We have done lots of fun books in the past. Just this year we have completed books about Apples, Pumpkins and Scarecrows. For the 'Apples On Top' we read the book 10 Apples Up On Top by Dr. Suess. Then, we tried to balance 'apples' (we used bean bags) on top of our heads to see how many we could balance. I took a picture of each child and placed it in the class book. For 'How Many Pumpkins? ', I placed numbered pumpkins vertically on the wall (with #1 on the bottom). We measured ourselves against the pumpkins to see how many pumpkins tall we were! I took a pictures of each child and they completed a book page by coloring in how many pumpkins tall they were. The 'Scarecrow Scarecrow' class book was more of a creative thinking activity. We learned about how scarecrows scare crows. We thought of something a scarecrow might scare and drew a picture. The individual book pages said: 'Scarecrow, Scarecrow how scary can you be? You scared a ______, but you can't scare me!'. This book was a fun one to see what they children came up with! Our gingerbread book has not been completed yet, but each child will finish a page in the book with this template: 'Run, Run as fast as I can, ______can run faster than the gingerbread man.' Students will also draw a picture to mach their writing. I always help students fill in the book pages when/if they need assistance in writing. Do you create class books? Class books for preschool classrooms. Do your kids know the traditional nursery rhymes that we used to recite as kids? I bet you remember Jack and Jill, Hey Diddle Diddle and Little Miss Muffet, don't you? What was the point of those rhymes anyway? Whether you knew it or not, there was some big benefits to reciting those rhymes with your parents or teachers. Not just language benefits, but brain and emotional benefits as well. Check out the infographic below to learn how reciting these rhymes with your kids could be benefiting their development. Now you know the why. What about the how? The easiest way I implement Nursery Rhymes into my day at preschool is by focusing on one during a week at circle time. I have a run down of what I do each day in the image below. If you like the flow and graphics of the Nursery Rhyme mini kit, you can get them here! 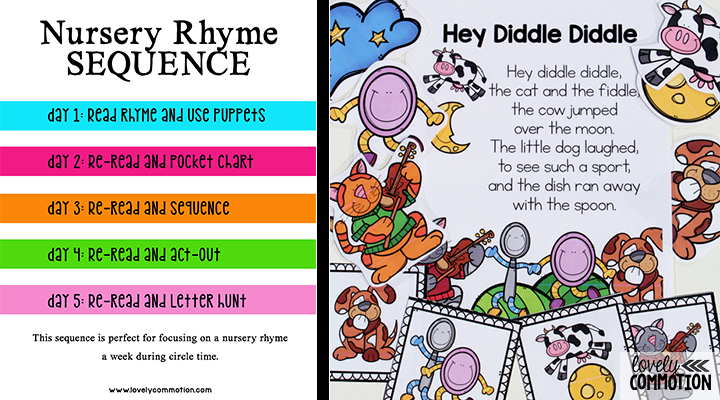 Nursery Rhyme Sequence for Preschool Circle Time. Starting our Five Senses unit, I wanted an activity for my preschool students that would be attention grabbing. What is more exciting than watching popcorn pop in an air-popper?! Popping popcorn is perfect for all five senses! We started by looking at and feeling the popcorn kernels before they were popped. Then, I popped the kernels in our air popper at the carpet area. I gave each child a cup of the newly popped popcorn and asked them to evaluate using their five senses. We recorded our describing words under the 5 senses popcorn words (which I have provided you for free below!). 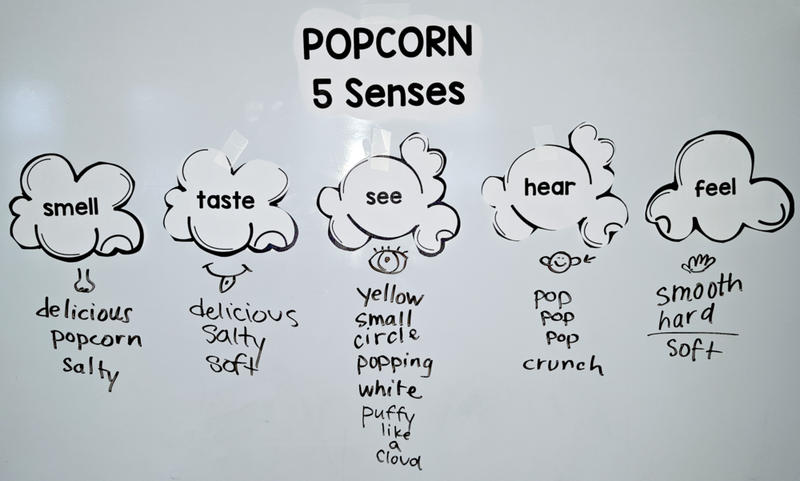 Popcorn five senses preschool activity. 5 senses two and three year old lesson plan.